It wasn’t my intention for this space to turn into an “all about babies” blog, but let’s face it, my life pretty much consists of work and hanging out with the kids, so if I’m going to continue to use this blog as a way to record our lives, then the reality is that is will consist of content nearly solely devoted to the boys. As we rapidly approach the boys’ first birthday (how did that happen?! 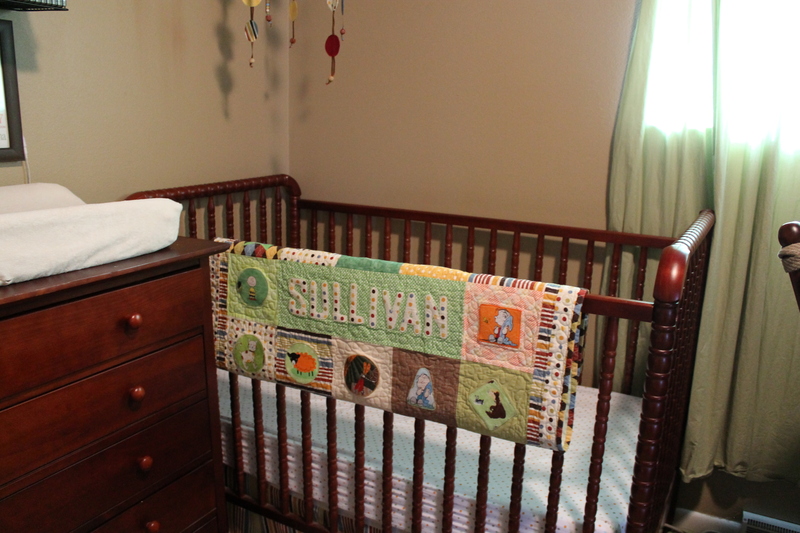 ), the nursery will experience a slight change in decorum, so I thought I would post some pictures before I switched things up a bit. 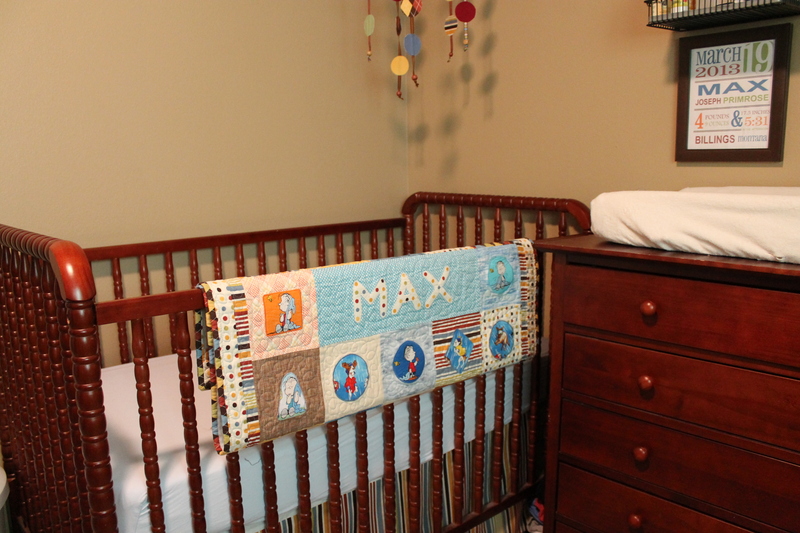 Taking pictures of the nursery has always been tricky because the room is pretty small – it’s only 9 x 12 – which is one of the reasons why it’s taken me so long to get something posted. The space would have made for a perfect single kiddo room, but with two it’s now a really cozy and efficient little nursery. I always get a little jealous when I see pictures of other people’s spacious bedrooms (our master bedroom is also the size of a matchbook), but I really like how the space turned out and am excited to finish up a couple projects and get them in the room, as well. 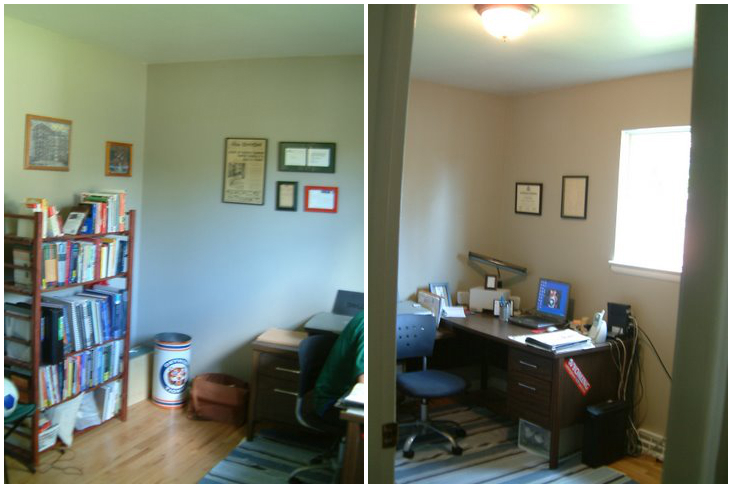 The room as it looked after we first moved into the house 6 1/2 years ago. A little before and after action shots. 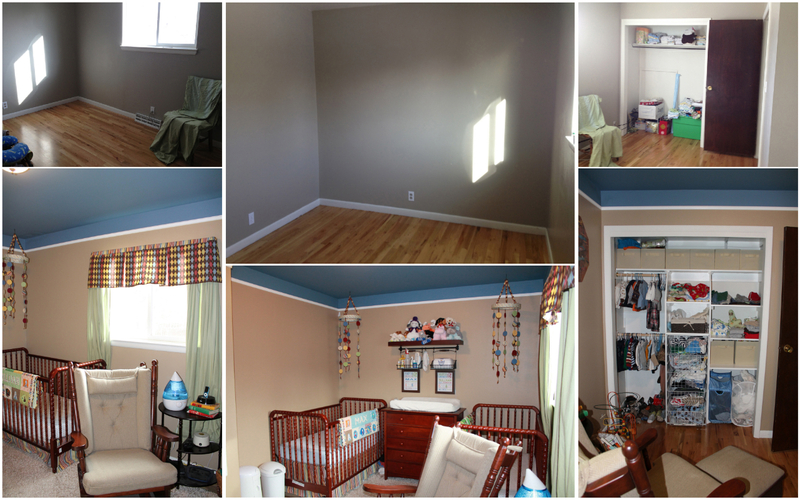 Even though it’s been well over a year, a big shout out to our friends Joe and Amara who helped us paint the nursery. 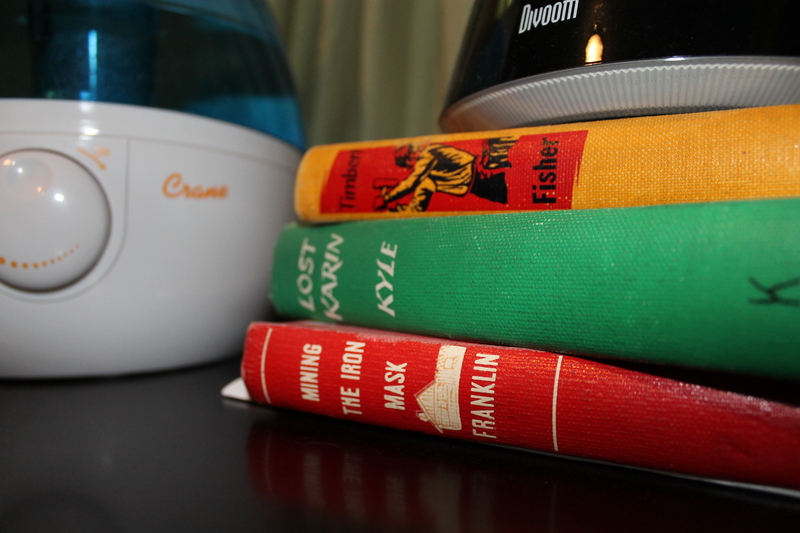 I was seven months pregnant when we decided to start working on the room. If any expectant Mommas actually read this blog, may I suggest starting on the nursery when you’re a little less pregnant; I had a sore back and sore, swollen feet by the end of the day. But thanks to Joe and Amara – Joe is one tall dude and painted two coats on the ceiling with ease, and Amara’s theater background gave her mucho painting experience – we knocked out painting in one day. Also a big thanks to my parents who, when they came for the baby shower, put up the white trim and built a custom closet for us. They came down a couple days early and had to deal with my pregnant brain’s inability to measure the closet correctly and an unsquare opening to the closet (hence, no closet doors). They primed, painted, measured, remeasured, sawed, nailed and added the finishing touches to the foundations of the room. The floating shelf is from Amazon and the baskets are from IKEA’s kitchen department. 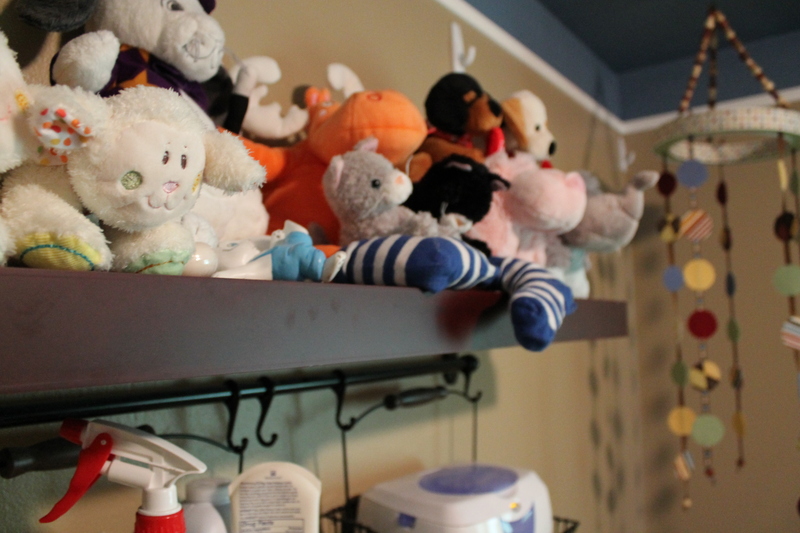 The dresser’s top drawer is full of diapers and other random baby accouterments (thermometers, Nosefridas, old pacifiers) and the others are devoted to towels, washcloths, bedsheets, and baby blankets. I totally stole this idea from someone’s Etsy shop. I saw the image on Pinterest, and upon seeing another Pin that said you could create this type of artwork with Microsoft Publisher (or Mac’s equivalent), I figured I could handle it. They turned out pretty well and I bought some cheap frames from a store in town and spray painted them to match the color scheme of the nursery. 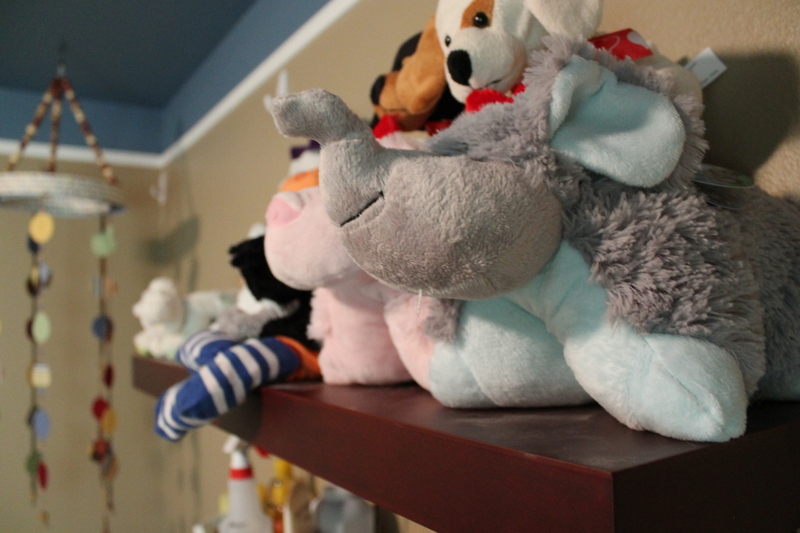 The stuffed animals were too cute not to capture on film. They make for great distractions in the morning for whichever boy I’m not changing and getting dressed. Quilts from Grandma. We had to take them off the sides of the crib as soon as the boys became aware of their presence and started tugging on them. They’ve lived on the back of the glider ever since, but The Nursery 2.0 has a new home for them; they’re too beautiful not to display all the time. 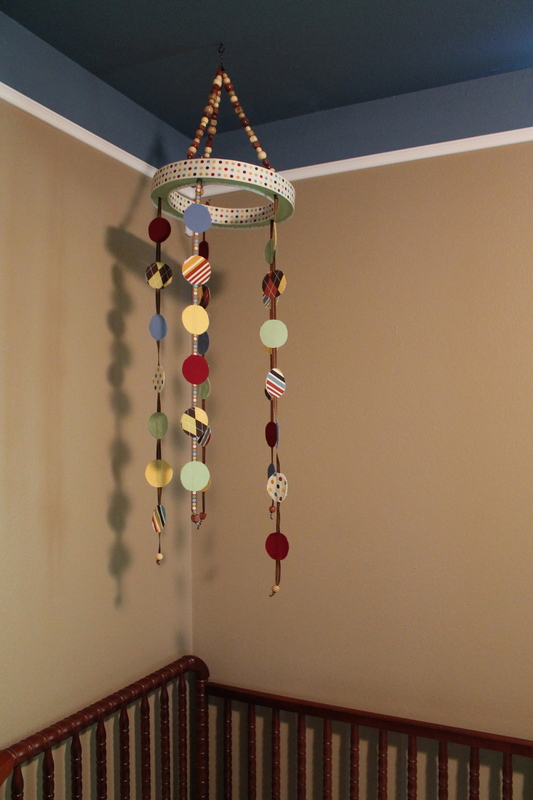 Mobiles for each of the boys, made by my sister, Abbey. 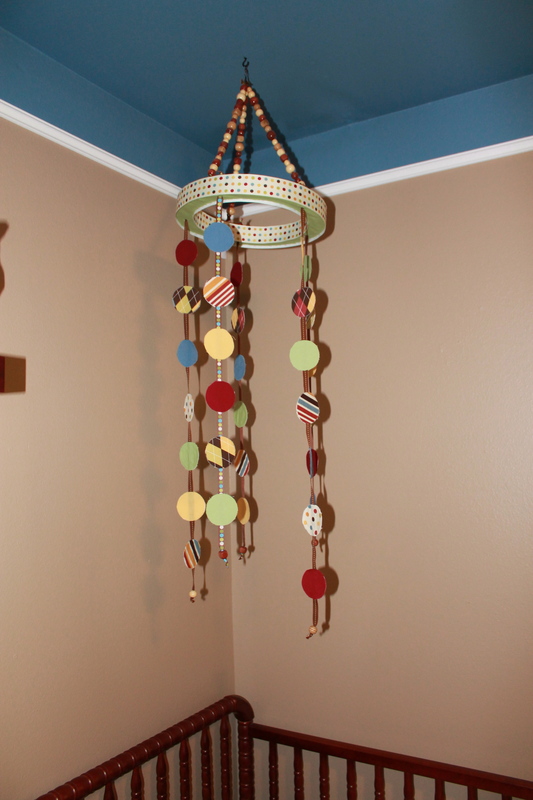 She’s a super crafty person and she’s made mobiles for all her nieces and nephews, among other adorable items. I requested something a little different than what she had done in the past, so I really appreciated her being a good sport about my “vision” for the nursery. Tranquility base. 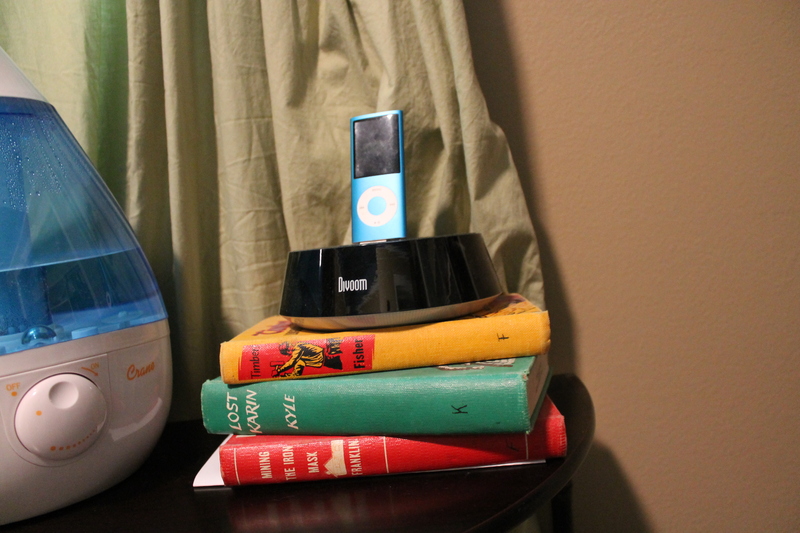 This area includes all things calming: the glider, white noise machine, humidifier, books, and iPod. 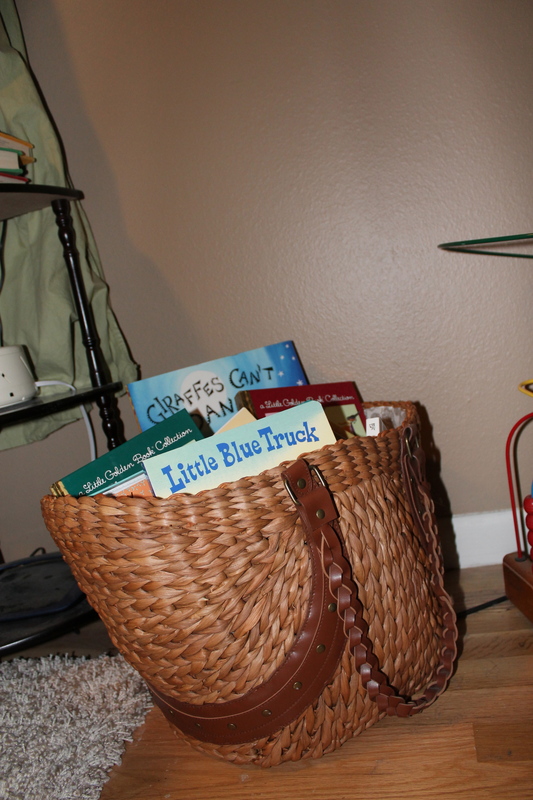 For awhile, all the kids’ books fit into this cute wicker bag that I received as a gift at my bridal shower. The Nursery 2.0 also includes some plans for bookshelves to display their ever growing collection. 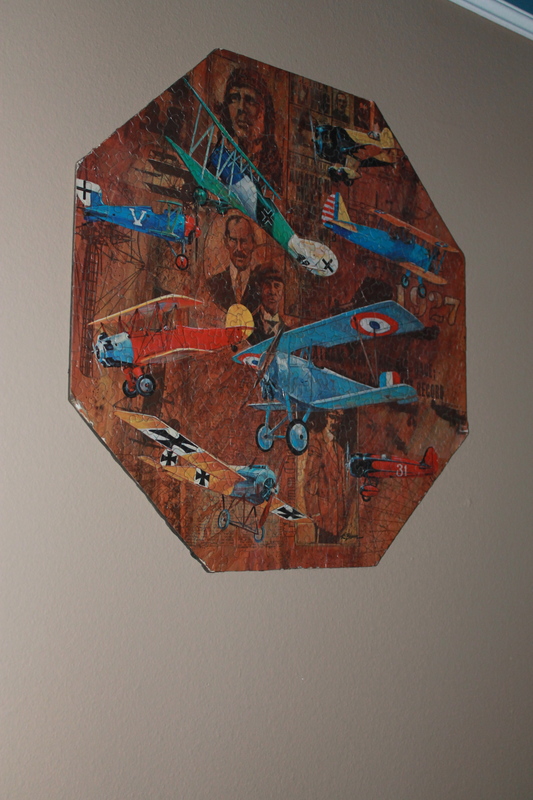 Paul and his Dad put this puzzle together when Paul was a kid. 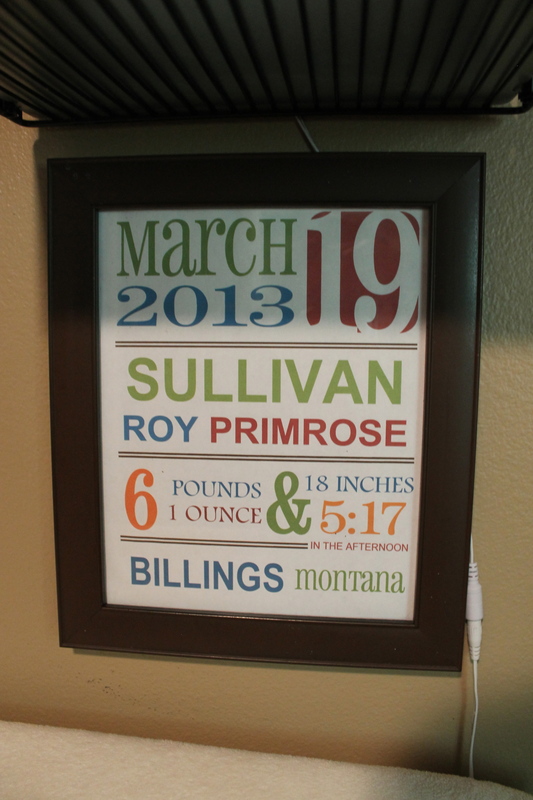 When Joe and Vicki moved back to Casper, they brought this along and gave it to Paul. 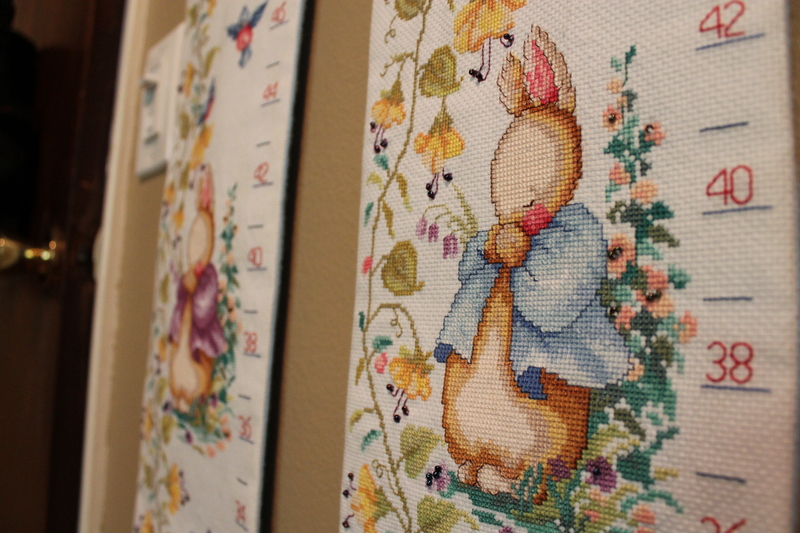 It goes perfectly in the nursery. It will stay in The Nursery 2.0 and for many years to come. 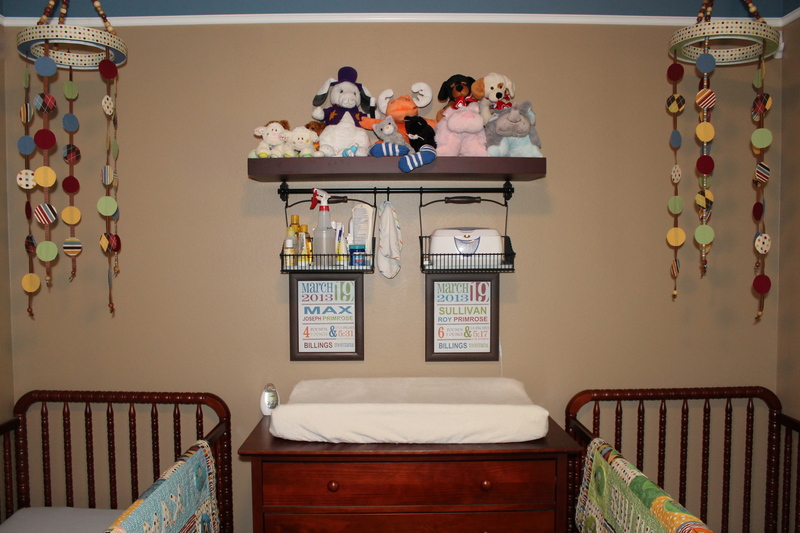 Alright, last featured section of the nursery. If you’d made it this far, thanks for your dedication. 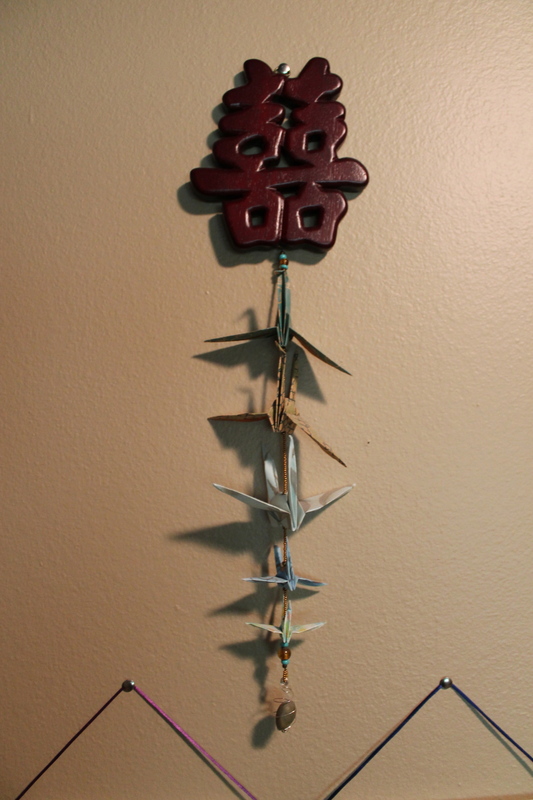 The wooden Chinese symbol is a gift from Paul for our 5 year (wood) wedding anniversary. It means double happiness. Perfect gift to mark the occasion, no? 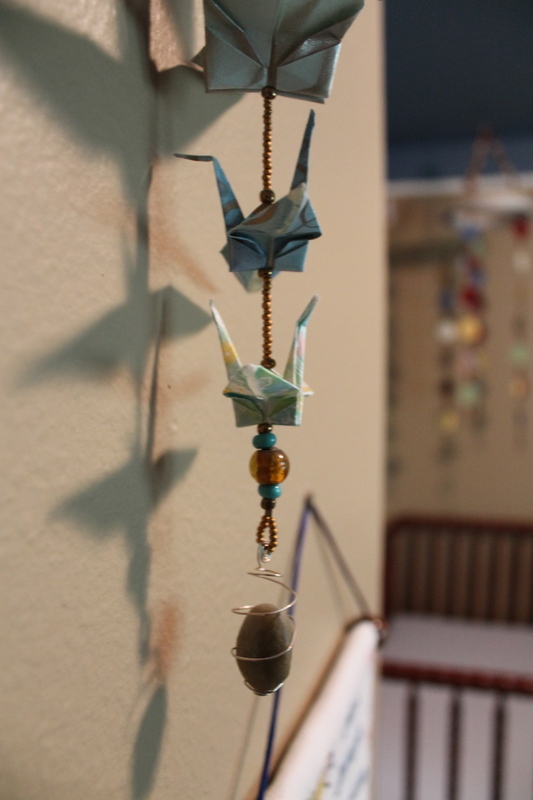 The chain of cranes is a gift from my former boss. She sent them to us while we were still in Billings. She read this book to both her daughters when they were younger and when she saw the cranes at a local art co-op, she thought of us and sent them our way. 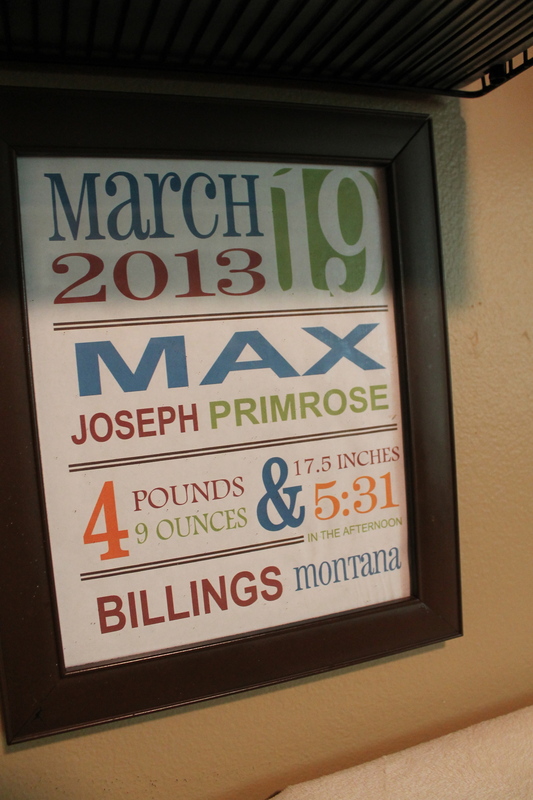 My aunt made these beautiful growth charts for the boys. 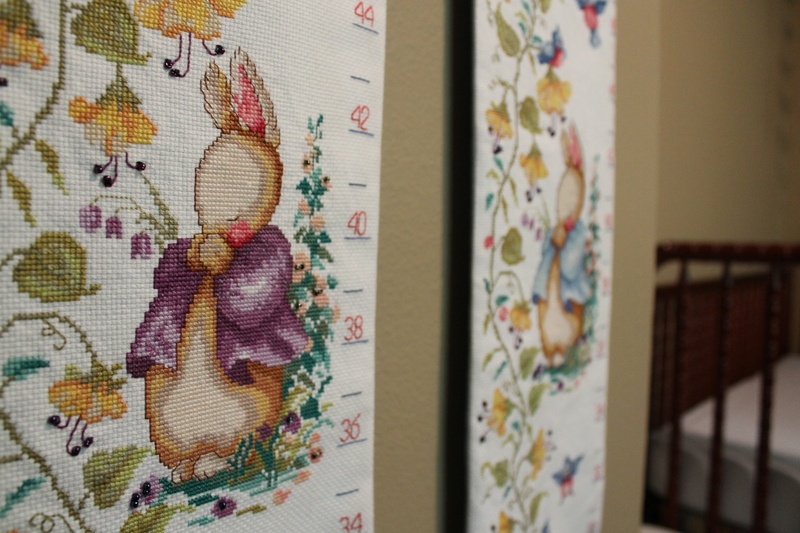 She also made a beautiful cross stitched/embroidered piece in honor of our wedding. 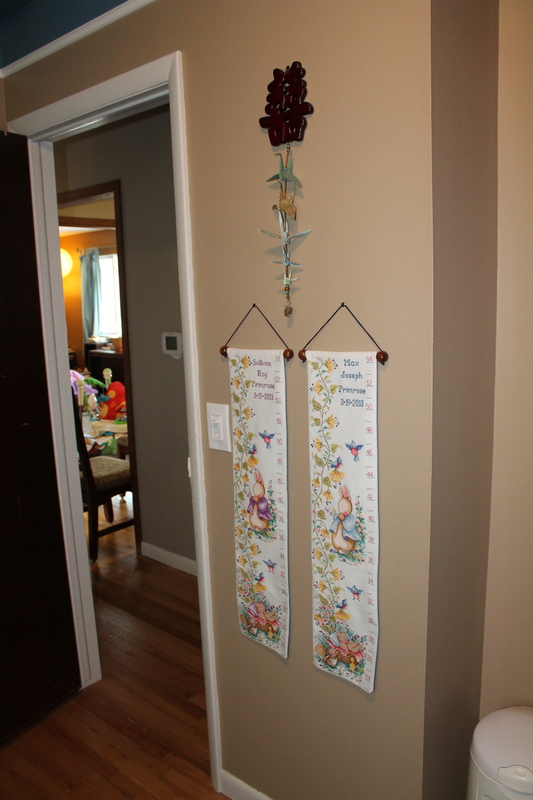 She is very talented and skilled and I was so excited when they arrived in the mail and we got them displayed. So, there you have it. 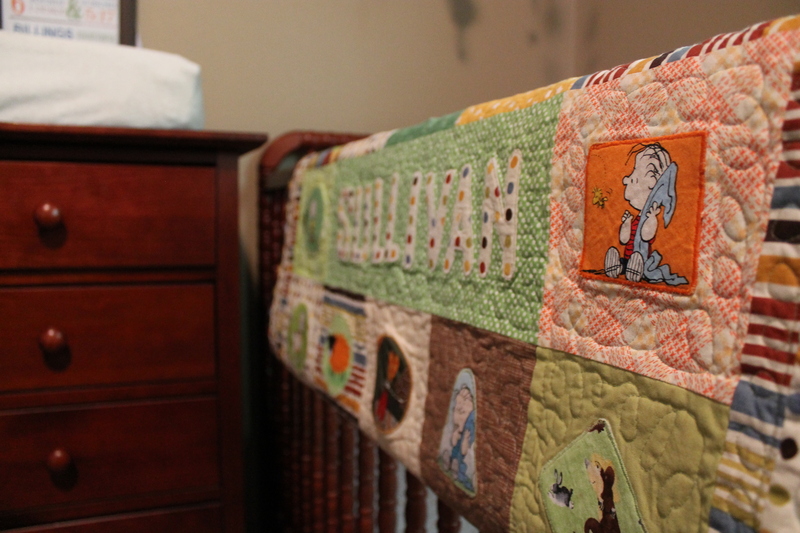 The first version of the nursery. 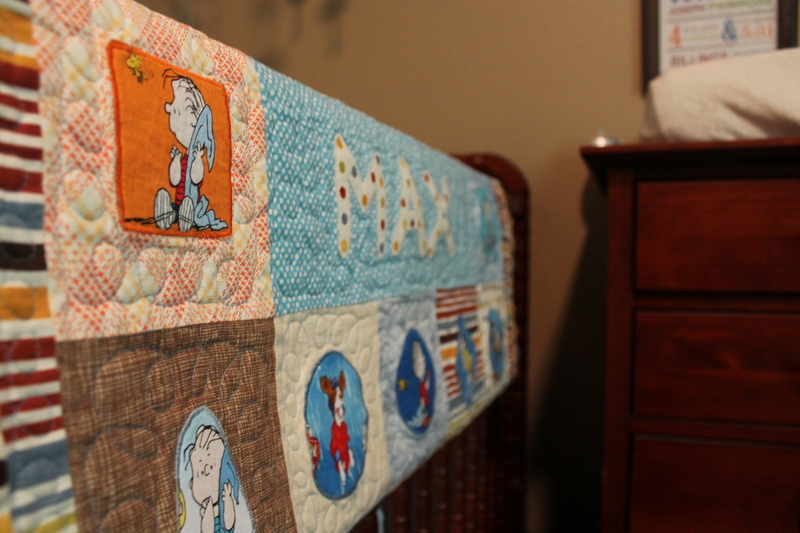 I also can’t end this post without pointing out that my Mom and sisters help me make the valance and crib skirts during our Christmas 2012 visit to Big Horn. They turned out great, despite the fact I found the pattern for the valance online and it had some pretty vague instructions that my Mom and Abbey had to decipher. Next time, I’ll just buy a legitimate pattern. 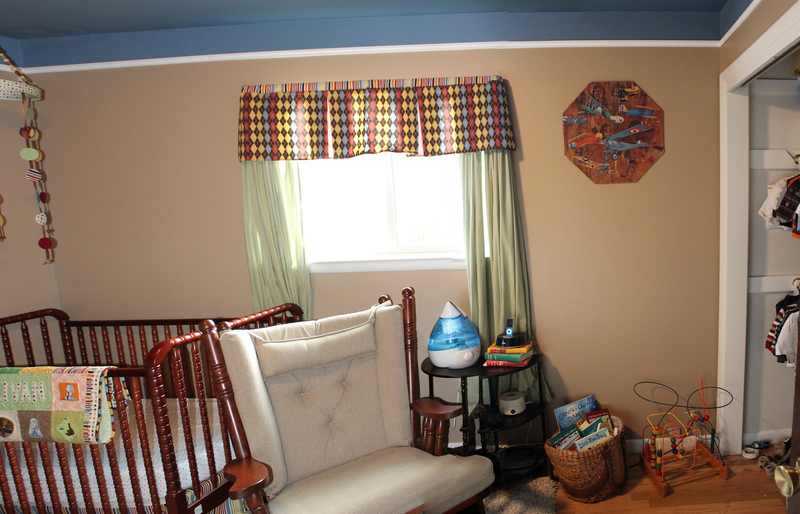 Thanks again for working with me and the ideas I had in my head for this room. 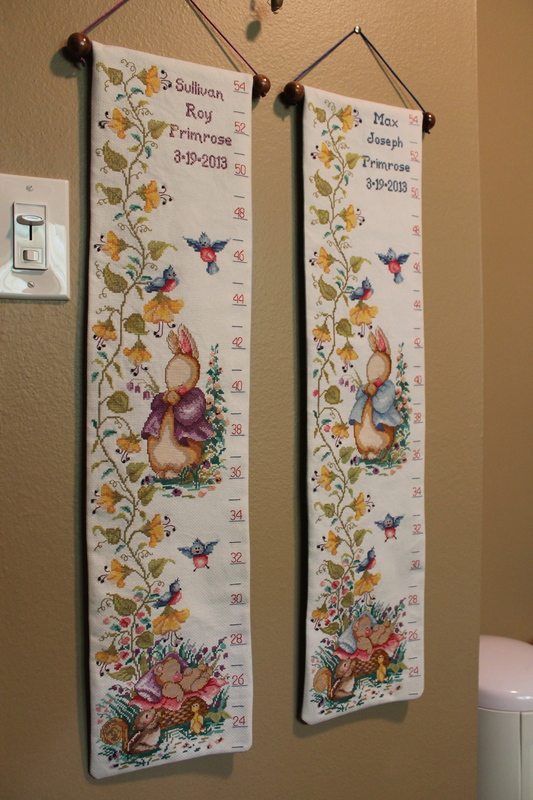 When I get the other projects done and the next version of the nursery is complete, I’ll be sure to be a little speedier about posting pictures. Wow, what a beautiful space you’ve created, Kathryn and Paul! What lucky kids those boys are! I can’t wait to see 2.0 — 1.0 was pretty wonderful.